Take advantage of our fabulous Riverview Four-Poster Suite the room has a large private balcony with Hot Tub, 42" flat screen TV & DVD, CD player, Spa bath & lots more so you can indulge yourself in a truly Romantic Break. The package includes two night stay in the Riverview Four-Poster Suite with petit-fours, flowers and Champagne upon arrival, plus a candlelit dinner for two overlooking the river Conwy on both evenings and a full Welsh breakfast served to your room or in the restaurant. This fabulous package is available from £342.50 per person for two nights. Hotel Wins Gold For 8 Years Running. 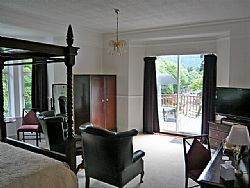 Enjoy a Honeymoon or Romantic Break in Snowdonia with our great deal. Content is copyright Craig-y-Dderwen - The Riverside Hotel, Betws-y-Coed, Snowdonia, North Wales, UK.